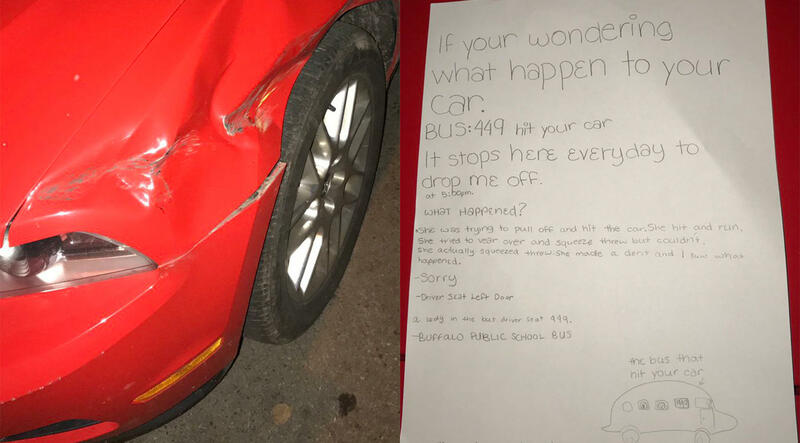 A college student from Buffalo, New York, was surprised to find his car mysteriously dented last week, but he was even more shocked by the note left on his car. The note was not left by another driver, but rather, someone too young to be responsible for a hit-and-run. "If your (sic) wondering what happened to your car, Bus: 499 hit your car," read a hand-written note left on Andrew Sipowicz's car. The letter was from a person who witnessed an alleged hit-and-run and wanted to inform Sipowicz of what happened to his car when he wasn't there. "It stops here every day to drop me off at 5:00 p.m." the anonymous note writer said. "What happened? She was trying to pull off and hit the car. She hit and run. She tried to vear (sic) over and squeeze threw (sic) but couldn't. She actually squeezed threw. She made a dent and I saw what happened. Sorry," the person wrote. The note writer specified it was a Buffalo Public School bus that hit Sipowicz's car. That's right, the anonymous good Samaritan was just a kid, on her way home from school. She signed the letter: "a 6th grader at Houghten Academy." The sixth grader also drew an illustration of the bus to really show Sipowicz what she witnessed. Sipowicz, a student at Canisius College, took a photo of the note and posted it on Twitter, where it gained widespread attention. The bus drawing included screaming kids, a funny detail many Twitter users pointed out. "Shoutout to the anonymous 6th grader for saving me a couple thousand," he wrote. "Bus not drawn to scale," he added as a joke. The tweet went viral and Sipowicz was able to post an update just one day later: "The student who wrote the letter has been found and we're in the process of finding a way to reward her for her actions. Very grateful for what she did," he wrote. Although the sixth grader's name has not been made public, many people wrote her messages on Twitter. And Sipowicz plans on meeting her and possibly giving her an early Christmas present for her good deed, Sinclair Broadcast Group reports. "I'm looking into going to meet her in person next week and thank her for what she did," Sipowicz said. The sixth grader didn't ask for any recognition, drawing praise from many on social media. Although her identity remains anonymous, it is clear she is wise beyond her years.